You may find it weird but I can't work in a quiet environment. I need music to keep me more focused in my job. But I prefer to listen to classical guitar or piano and not so much on songs. Instead of playing CDs or downloading instrumental tracks, I downloaded Sky.FM Internet Radio on my Android and iOS devices. Among the Internet radio apps I have tried, only Sky.FM streams seamlessly even on slow Internet connection. I'm tempted to buy the paid version because it has no ads but I have other priorities and I can still manage with the free version. Do you like listening to Internet radio? 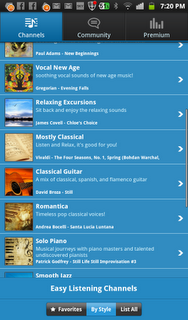 What''s your favorite Internet radio app?